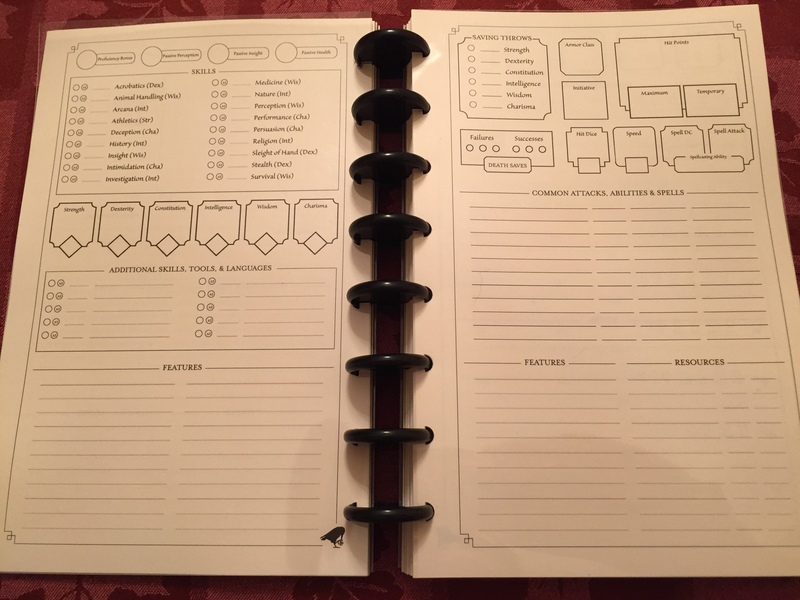 When playing tabletop roleplaying games, especially with the likes of Dungeons & Dragons, players always run into the problem of organizing their character sheets, notes, and whatever reference material they have at their disposal. Often, the table is cluttered with sheets of paper or notepads, which prevents the player from finding the relevant information promptly. 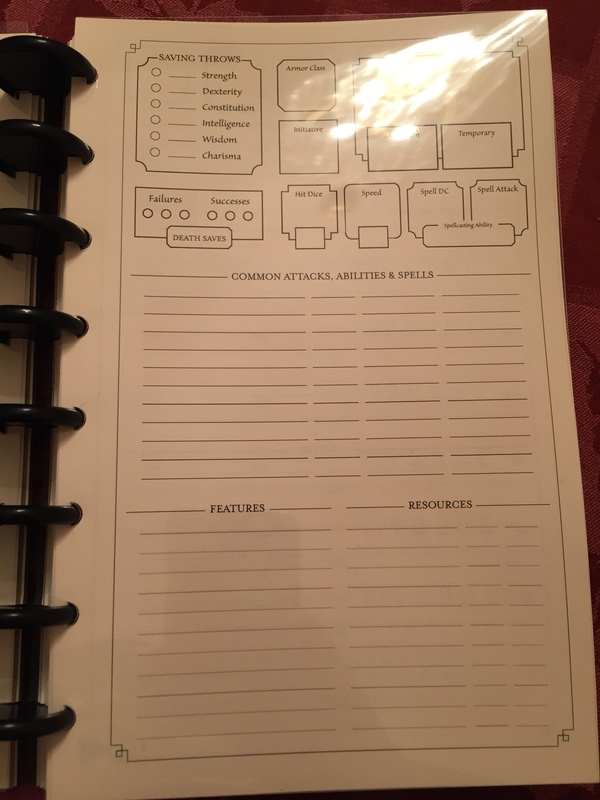 D&D Beyond is a digital resource that seeks to mitigate this issue, and various other attempts to keep the character sheet limited to only one piece of paper has been attempted many times. 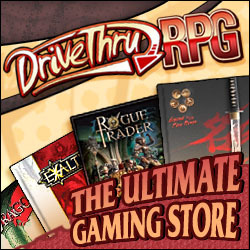 Most campaign journals or diaries for the most part just contain room to fit lore and non-essential materials, excluding space for character sheets or anything relating to the actual roleplaying system. Granted these journals are intentionally designed to be system agonistic and therefore should be considered a flaw or fault. Instead, for your Dungeons & Dragons 5th Edition needs, may I turn you towards something that is portable, easy to organize, and also aesthetically pleasing? I present the Mischief & Misadventures Campaign Diary (MMCD) by The Rook & the Raven. 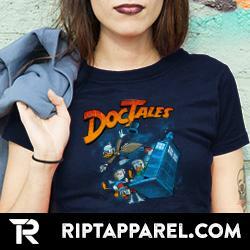 Preorders are available on the Rook & the Raven’s website until February 15th! When I first received my review copy, I wasn’t sure what to expect, but I knew something was special once I opened my parcel and saw the intricate amount of care taken by the creators. It was treated unique, and this diary is indeed extraordinary. The cover consists of heavy cardstock with a more substantial piece featuring artwork from Deven Rue which I thought was aesthetically pleasing. The weight of the diary felt light overall, while the notebook profile was elegant, the ringed arrangement does take up more space than I had expected. It rests on a surface with a slight curve which can be annoying at times, but it’s a minor obstruction. 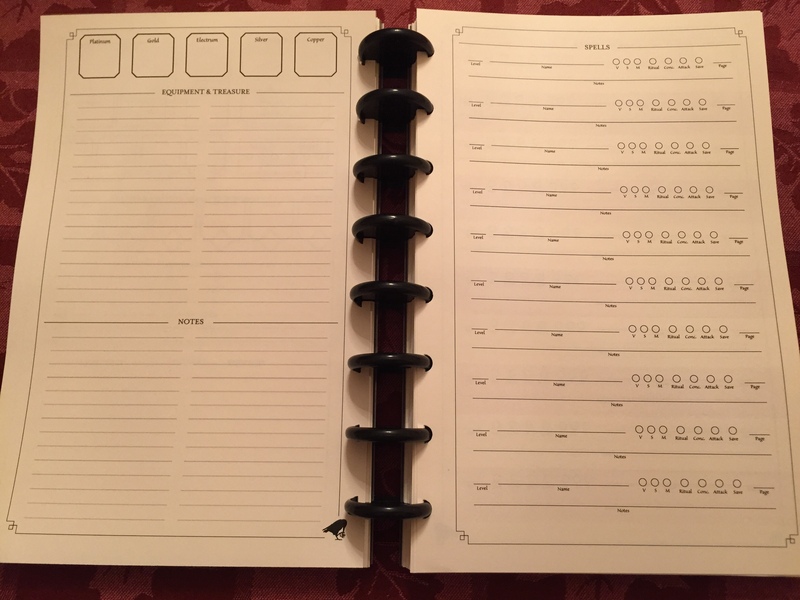 This diary consists of pages for your character sheet which includes pages to list your spells. 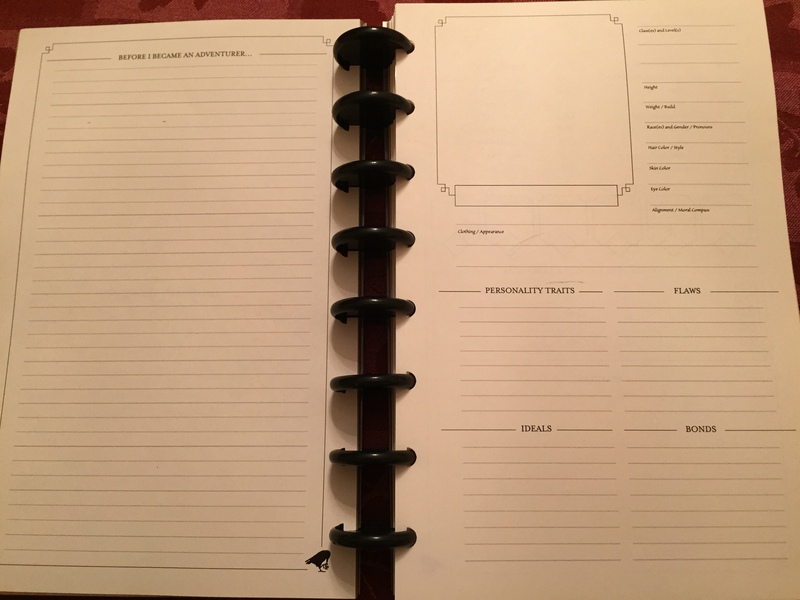 There several sections of the journal that contain pages for session notes which can be quite handy for that player that enjoys taking down notes. If your player needs more space for notes, there are general notepad style pages to write more extensive notes. Some sections act as index cards wherein a player can use to keep track of magic items and even serve as temporary spell cards. Some pages are blank spaces, which are great for sketches, especially for things that matter to your character. Additionally, you can rearrange the sections and pages of your MMCD very quickly with their unique ring system. You can also order your MMCD a la carte and choose which packets you need if you do not prefer the more generalized edition. It’s encouraged that you get the hard plastic Book Armor to give your MMCD some longevity and protection. I could see that that the cover gets reinforced with a thicker material to avoid that issue honestly, but for now, it’s not a bad add-on. If you use the official Spell Cards from Wizards of the Coast or make your own, the Rook & the Raven offer unique cardholder pages similar to what you would find in trading card binders. I inquired about sectional dividers or tabs for the diary and was informed that the idea initiated before the development phase of the product but was not pursued due to the inability to secure a quality product. The only consistent downside that I found with the MMCD is that the pages, no matter how careful you manipulate them, they will eventually wear down. It’s the very nature of the paper. Unfortunately, resorting to heavier paper will not reduce the overall wear and tear inflicted. It’s easier to keep the pages you need accessible and anything else (such as session notes) to be added separately to the diary. I would like to see a smaller ring design with the diary to further reduce it’s size profile, as it stands currently, it takes up a little bit more space than others of similar design. Though I understand that the current ring size is to facilitate the necessary amount of pages available but if you were to specialize your character diaries, it would require ideally less paper. 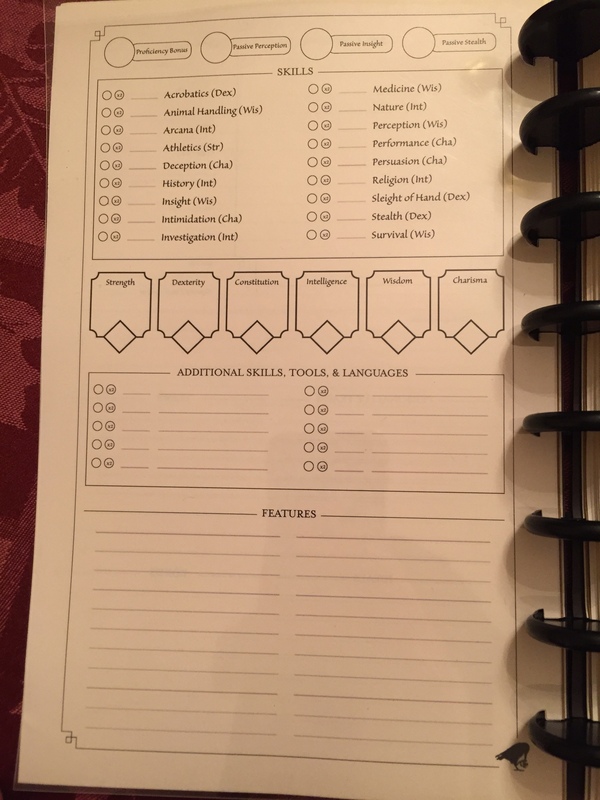 As a whole, the Mischief & Misadventure Campaign Diary is a great product to have as a character sheet alternative. The overall design is aesthetically pleasing, and ring-binding is very unique. The pages could be made thicker, but I feel the cover could definitely be made of a cardboard-like material to help reinforce it and protect the diary better. The Body Armor cover is excellent for preventing smudges, and I ordered the spell-card sleeves to try out as well. There is plenty of care and the folks at the Rook & the Raven genuinely wish to create a quality product, whch is definitely reassuring. My one general advice when using one of these diaries is to not fully assemble it beyond your character sheet, spell slots, and a few page packets for sketches or even the graph-lined paper. The session note pages are better kept out of the diary and written separately from the journal before placing them into the ring-binding. You can follow The Rook & the Raven on Twitter. You can Preorder your copy of the Mischief & Misadventure Campaign Diary (until Feb 15th) here.